Directed by M.I.A. herself, you can see Maya wearing the gold chain grill she was packing during her “Late Night with Seth Meyers” performance. 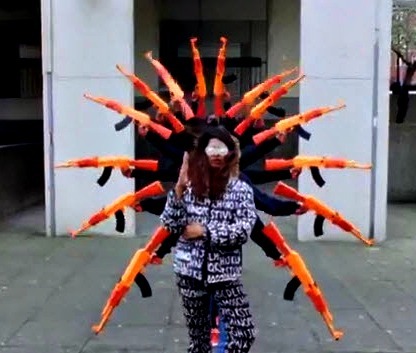 The video features multiple shots of puffs of smoke, twins, 3D printed guns, dancing, Asian dudes getting Asian characters tattooed on their backs, neon drones, and some severe migraine-inducing flashing images. If you can’t handle the flashing images, I suggest you tab over to another browser for the last 30 seconds. The song is remixed by The Partysquad, so despite it sounding like the album edit, it’s 25 seconds longer than the LP cut.